Father’s Day is just around the corner. 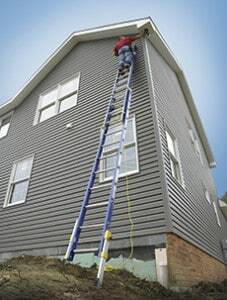 For the landlord or handyman dad, consider giving a Werners Fiberglass Equalizer® Extension Ladder. These ladders are as good as it gets for do-it-yourself property owners with outdoor home improvement projects, especially on uneven surfaces. Factory-installed leg levelers help keep a dad safe in a variety of situations. This is the perfect tool for high-up maintenance projects like clogged gutters, or sprucing up soffit and fascia with a fresh coat of paint, which often present challenges to the average property owner. But, relying on a ladder that increases stability, and therefore productivity, makes the job easier and safer. Available in 16, 20, 24 and 28 feet with a 300 lb. total load capacity. A full selection of Werner ladders for both consumers and professionals are available at most professional, hardware and paint retailers nationwide. For more information on the Equalizer® Extension Ladder Series see WernerLadder.com.